The California Ocean Edition adds more style and exclusivity to Volkswagen’s world famous glamper van. 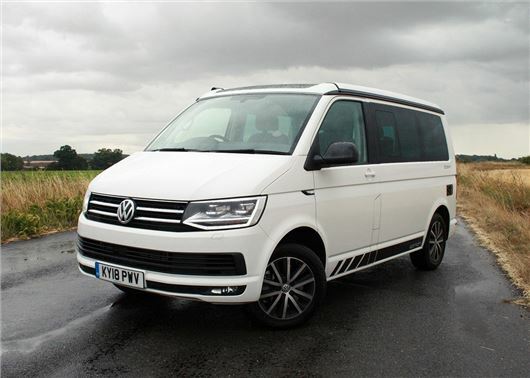 Purists in tents might sneer at its extravagance and lofty price tag, but it’s difficult to deny that the California continues to set the standard for camper vans everywhere. The Volkswagen California Edition is available in Beach or Ocean trim, with the latter (tested here) getting a fully fitted kitchen with cool box, sink, stove and electric roof. You also get Volkswagen's powerful 2.0-litre TDI 204PS engine, linked to a seven-speed DSG transmission as standard. Prices for the Ocean Edition start at £65,879. And like all Californias, residuals for the Edition have a gold-like quality. One of the big selling points for a compact van, like the California, is found in its ease of use. Setting up camp takes just a few minutes, with the electric pop up roof and swivelling front seats transforming the interior into a smart, two-tier living space. The interior is beautifully finished, with white wood coverings and lots of useful storage compartments that slide or drop open at the press of a button. The California has lots of home comforts, with running water, electricity hook-up and a secure connection for a gas bottle. This means you can cook, watch a movie on a laptop or wash up without having to leave the comfort of your van. There's also a heater for when the weather turns cold and a pair of chairs, stowed in the rear tailgate, for enjoying the sun. While the intelligent interior is impressive there are some niggling issues; the blinds have a tendency to catch the window edges and buckle as you raise them, which makes them quite fiddly. The sliding kitchen cupboard doors also jam with annoying regularity. Comfort is one area where the California cannot be criticised. The upper sleeping area has a large double slatted bed with a soft mattress that makes it easy to get a good night's sleep. A second double bed is created by folding the rear seats flat, making the California a genuine four-sleeper. The van is filled with LED lights and raised switches that make it easy to find your way around during the night. Despite its premium price tag, the California Ocean Edition doesn't get a side awning as standard, which is disappointing: in our view the roll out cover is an essential feature of any camper van and Volkswagen really should have included it at no additional cost. However, you do get darkened privacy glass and an exterior shower connection, which is handy for changing and rinsing wetsuits or swimming gear when at the beach. Unlike its larger rivals, the Volkswagen California is stress-free to drive on narrow country roads. Indeed, at 2.3 metres wide it'll glide down a single track road without collecting tree branches or local foliage. Its 1.9 metre height makes it a comfortable fit for multi-storeys and beach car parks too. The huge door mirrors eliminate blind spots and front and rear parking sensors (with rear view camera) are fitted as standard to make parking simple. In our view, the California is as easy to drive as any large family SUV. The upright driving position does take a bit of getting used to, but the light and responsive steering makes it easy to feel at ease behind the wheel. Road and wind noise are well supressed, but the 17-inch wheels do provide a firm ride and this can make things quite bumpy on less than perfect roads. The 204PS 2.0-litre diesel might sound like a boisterous amount of power for a camper, but it's actually a good match for the California. The 150PS version of the 2.0-litre is sufficient, but it can feel a little breathless when dragging a fully laden camper up a hill. The 204PS unit suffers no such problems and the seven-speed gearbox generally works well with the high levels of low-gear torque. Our only criticism of the auto ‘box would at cruising speeds, where it has an annoying habit of holding too long on a gear, which can make the engine quite noisy at around 50mph. Fuel costs can also become quite pricey, with the high-powered diesel returning an advertised 38.7mpg. That figure is true enough on the motorway, but on slow, twisty A road economy quickly drops into the high 20s. With prices starting at £65,879, the Ocean Edition requires a significant outlay. However, for those who already want the 204PS 2.0-litre TDI engine with the auto 'box, it only represents a £3050 premium over the standard Ocean. And for California buyers who are willing to part with the best part of £70,000, we think this this additional cost will seem insignificant given the extra kit and exclusivity you get with the Edition model.